With the new year comes new products, and we're pleased to introduce the first for 2018: debris netting on a cardboard core. 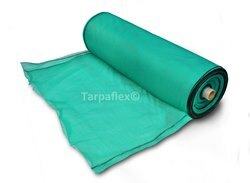 Available in green, this 2m x 100m roll comes folded to a metre length, on a central cardboard core. This means that the netting can be unravelled and cut to length as required. Knitted eyelets run along both outer edges to enable convenient fixing - cable ties are ideal for this. This netting is a really useful product for scaffolders who may only need small lengths at a time, or those who may require a longer continuous length than our previous standard 50m rolls. It's also great for people sharing netting for allotments, or for re-sellers such as garden centres who can easily spool lengths off the core for sale.